For quite some time, I’ve been itching to make a lager. It was on my goal list for 2015, but never quite happened. The main thing deterring me was the time investment–the process takes longer than an average ale, so I didn’t want to tie up my fermentation chamber for months. I have to keep the taps on my keezer all occupied, after all! When I discovered a “quick-lager” method, that provided the incentive I needed. This is a technique popularized by the folks at Brulosophy (although not developed by them, as they are quick to point out). Essentially, you use a temperature-change regimen to keep the process moving along. Most of the potential off-flavors are produced in the first half of fermentation, so once the beer is more 50% attenuated, you can raise the temperature and speed up the finishing. Then, it’s a cold crash, some gelatin, and you’re done! For my first lager, I chose a recipe that my dad has been brewing for many years. It is a “Pre-Prohibition Pilsner,” in the style of the American beers that were made before Prohibition destroyed many of the traditional breweries and beers. He makes an extract version that is absolutely delicious, and has been brewing it in some form or another for close to 15 years. The original recipe came from the April 1999 issue of Brew Your Own, and I have modified it slightly for hop and yeast availability. The main changes are using Spalt instead of Tettnanger and WLP800 (Pilsner Lager) instead of an American pilsner strain. I will note that the rye flakes are “off-style” for a classic American pilsner, and I suppose the yeast is too. But, it’s homebrew, so I’ll make my beer the way I want to and forget about official style guidelines. I also wanted to approximate the classic water of Pilsen, so used a water blend heavily tilted towards distilled water. Our tap water here has a ton of minerals, and so is not well-suited on its own for the styles (including American pilsners) that are best with soft water. “Special water blend” – 2 gallons of the carbonate-heavy Claremont water with 7 gallons of distilled water. Five days in advance, I prepared a 2 liter yeast starter, and let it ferment out for 2.5 days (after the krausen had fallen). I then put it in the refrigerator to cold crash for another 3 days. I mashed in with 4.25 gallons of water at 161.8°, aiming for a target mash temperature of 149°. The mash hit 149.8°, and was down to 146° after 55 minutes. After the 60 minute mash rest, I added 0.84 gallons of water at ~160°, let it rest for 10 minutes, vorlaufed, and collected the first runnings. Then, I added 3.82 gallons of water at 180°, which brought the mash bed up to 162°. I let this rest for 10 minutes, vorlaufed, and drained again. In total, I collected 7.75 gallons of wort with a gravity of 1.043, for an efficiency of 82%. I suspect my water volume must have gotten off somewhere in the process. But, I’m not too worried because this is my target gravity anyhow before the boil. I brought the wort to a boil, and added the hops, Irish moss, and yeast nutrient per the schedule. After 60 minutes of boiling, I chilled the wort to 74° using my wort chiller. Then, I transferred it with aeration and placed it in the fermentation chamber for 90 minutes to bring the wort down to 60°. At this point, it was pretty late, and I decided it would be okay to pitch the yeast. 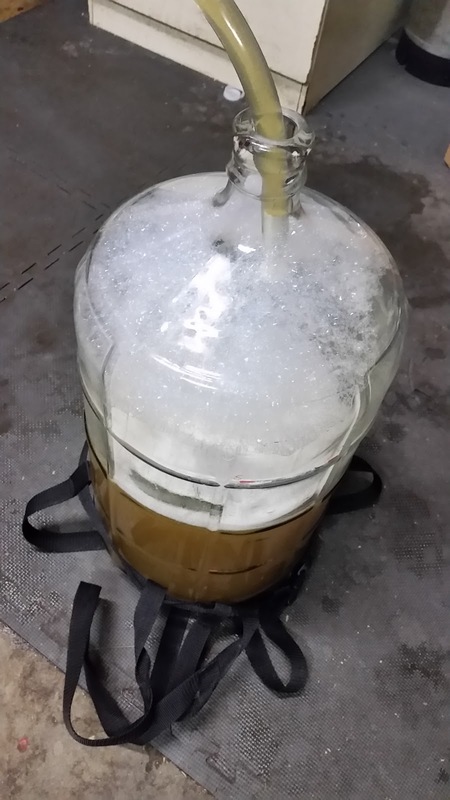 I saw evidence of fermentation (krausen starting to form, very slow bubbling in the airlock) when I checked on the beer around twelve hours later. Starting gravity was 1.051. I’ll do the first stage of fermentation at 54°. I brewed this on 9 January 2016, and will check on the gravity in about a week, to see if it is ready to warm up. This entry was posted in lager, pilsner, Pre-Prohibition Pilsner and tagged 3P, D3P. Bookmark the permalink.